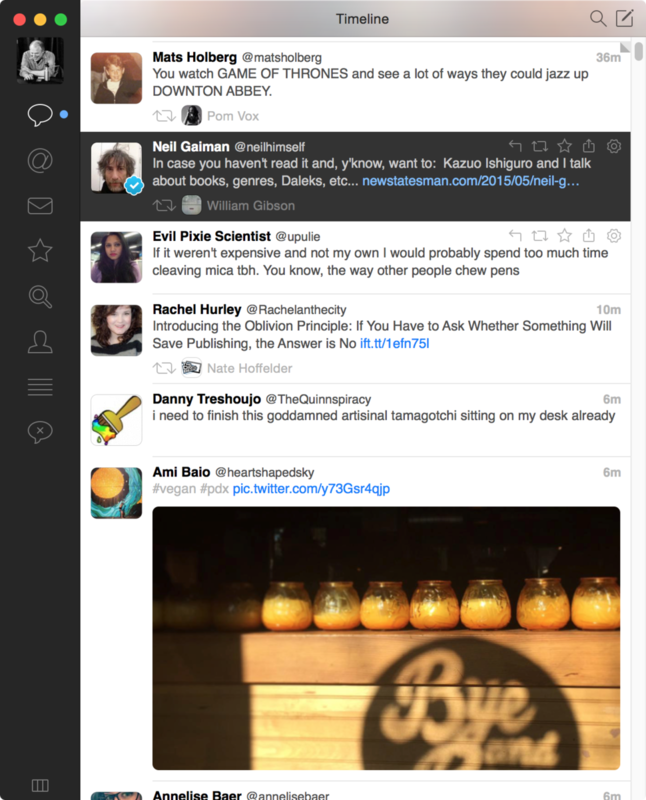 This overhaul to Tweetbot for OS X brings improvements, but also some horsiness. A minor upgrade is needed. When a service you use has its own free software, why turn to a third party for an alternative? The folks at Tapbots continue to answer that question with each update to their Tweetbot client for Twitter, available both in iOS and OS X. Tweetbot provides a straightforward timeline view, threaded conversations appear with a double-click, and there’s no need to buy into each of Twitter’s sometimes dubious and sometimes useful innovations. The latest OS X release, Tweetbot 2, is a welcome update with a more appealing design, but it still has some room to grow to feel polished and fully up to date. Given Tapbots’ ongoing development on both platforms, it’s easy to see where things are going, but they can’t get full marks for this version without further revisions. The main timeline view in Tweetbot 2 provides basic information about each tweet with icons allowing replies, retweets, and more. I’ve been a long-time Tweetbot user, though I’ve tried other third-party clients for Mac and iOS before and after Twitter’s policy change made it infeasible for developers without established user bases to create a business on new ones. I’ve stuck with it because I live in its timeline view and prefer to see single messages that I can drill down for conversations. Others may like Twitter’s native client or other apps that shows threads in the Home or timeline view. An avatar appears at the top for the current selected account, and multiple accounts can be added. Each account has its own preferences set for notifications, as well as which external services are tied in for “read it later,” URL shortening, image uploads, video uploads, and syncing your reading point in your timeline. 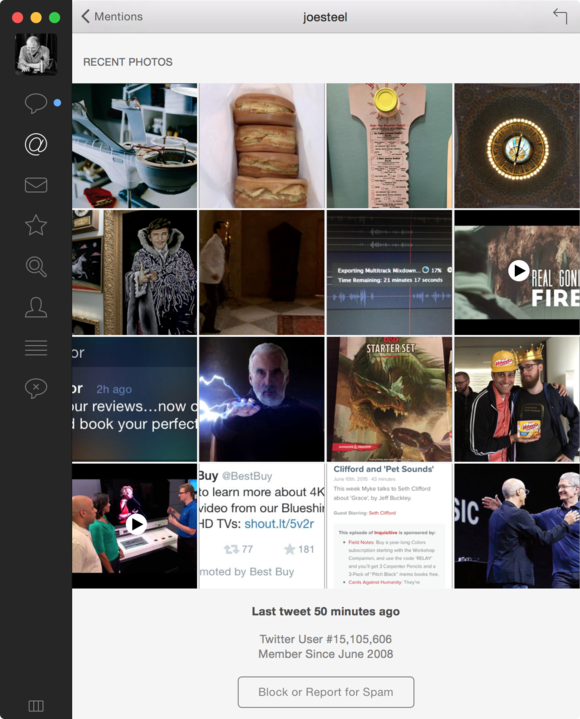 Tweetbot’s New Tweet window allows composition, including media, and revealing location. 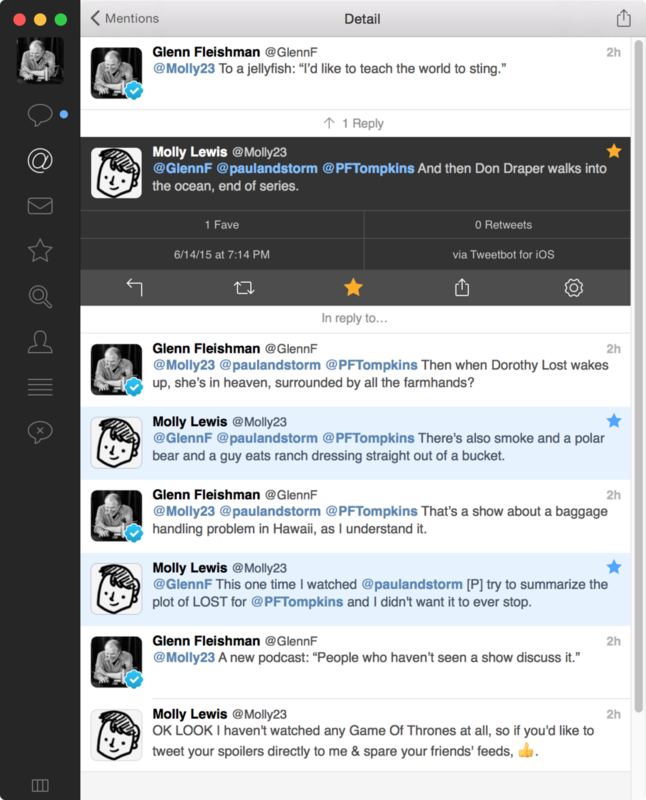 Tweetbot supports multiple columns, each of which can follow a separate stream, yet I’ve never found its approach particularly effective; most people I know who need multiple streams use (and swear at) Tweetdeck, owned by Twitter. In version 2, the user interface has been updated to the Yosemite (and now El Capitan) feel. Every element is crisper, and works better with Retina displays. I do find the controls in each message for reply, retweet, fav, share, and miscellaneous to be a bit too small in this release. And when a tweet is faved, its star overlaps the time stamp showing how long ago the tweet was made. In this update, you can opt to show a verified account blue checkbox directly on avatars, which themselves can be shown framed as squares or circles. Twitter has its own logic about which accounts receive verification (mostly athletes, celebrities, and journalists, including the Macworld staff), but it can be useful in following news to know at a glance whether or not someone’s identity has been double-checked. Retweets now show a shrunken avatar of the person sharing the message, which can again help in deciding whether or not to pay attention to it or follow links. Numerous small problems in this release need to be fixed for consistency, usability, and aesthetics. When clicking to view an image, a window appears that’s better formatted and has more options in its Share menu than Tweetbot 1, but it also cannot be resized. Tweets with multiple images allow no way to show all images without clicking them one at a time. Tweetbot still doesn’t support viewing videos or animated GIFs inline or through an in-app pop-up window, and instead opens a browser window. Threaded conversations are shown in reverse order. While you can easily opt to not include your current location, in the previous release this was signaled by a grayed-out Apple-style location icon in a new tweet dialog. In this release, that icon is accompanied by a large lozenge that reads Location Disabled, which seems like too much negative information—how often do we need to be told that strongly what we’re not doing? Every view in Tweetbot allows searching within downloaded tweets in addition to a Twitter search tab, but there’s a problem with focus: after entering a search term in version 1, you could press Escape to clear it and show all messages in the view. In version 2, the focus leaves the field, requiring a click and then Escape. There’s a lot to like, though. In the previous version if you were composing a tweet and wanted to navigate through other parts of the timeline or other tabs, you had to first drag the fresh tweet to disconnect it. Now, all new tweets are freestanding, which is a nice improvement. New tweets can have images and video added through the gear menu’s Add Image and Add Video items, but you can also drag them in. Handy in connection with the new Photos app, which is more painful to export and drag images out than iPhoto, is this sequence: select an image in Photos, choose Edit > Copy, and then in a new tweet window simply paste to queue it to upload with the tweet. Tweetbot 2 for OS X brings a feature from its iOS version: Recent Photos shown in a user’s profile view. I’ve been partial to Tweetbot’s mute options, which are separate from the global mute feature that’s part of Twitter’s main settings. (There’s no interface for those mutes within Tweetbot.) You can mute by hashtags, keywords, or accounts, and set expirations from 1 day to Forever. These mute lists sync across all of your copies of Tweetbot in iOS and OS X. If someone (such as me) is being a blowhard and you want to suppress them for a day or you never want to see the result of anyone’s Nike fitness devices, it’s a few clicks to tone down your timeline. 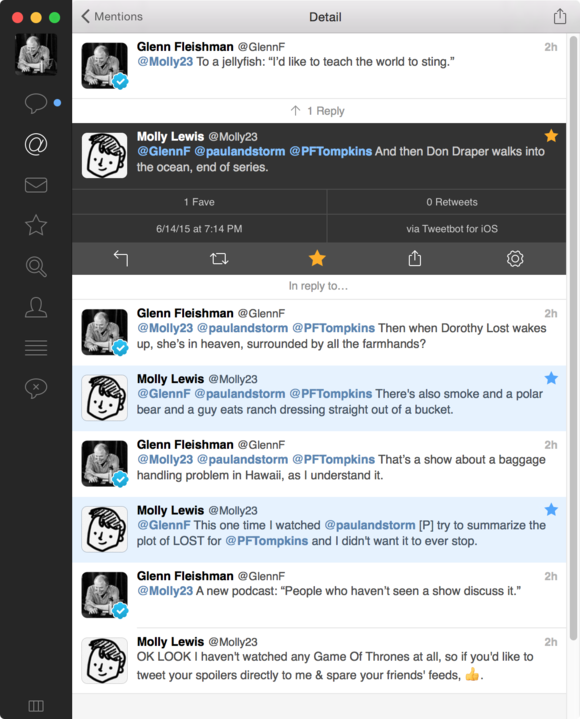 Tweetbot 2 has improved the look of this view, adding avatars to muted accounts. Twitter continues to roll out features and third-party developers aren’t always granted access right away through the service’s API (application programmers interface). Group direct messages (DMs) aren’t available outside of Twitter apps and its website yet. Longer DMs—up to 10,000 characters—have been announced by Twitter, but not yet released; Tweetbot has already been modified to support them, however. This review may sound generally negative, but this release is an improvement on the whole, and retains all of Tweetbot’s delight and simplicity of use. Tapbots needs to polish an update to push this version further forward. Twitter client sports a new design but the Mac app still needs some polish.